As the US and China smooth out the details of new budgets that dramatically increase military spending, Taiwan announced that it plans to bolster its forces with a vertical and/or short take-off and landing (V/STOL) aircraft, and Lockheed Martin’s F-35B is certain to be a prime candidate. Sputnik reported Wednesday that during the waning days of Barack Obama’s tenure as US president, the administration scuttled an arms deal that would have sent heavy military equipment, missiles and F-16 parts to Taiwan. US lawmakers berated Obama for failing to strengthen Taiwanese democracy by cutting such support for Taiwan. Taiwan has approximately 140 F-16s that the island state hopes to upgrade into F-16V variants. Taiwan’s air force doesn’t seem to be satisfied with that, however, and hopes to add stealth aircraft to the fleet as well, according to a filing from Taiwan’s Ministry of Defense (MoD). On Thursday, the ministry said in a “Quadrennial Defense Review” that stealth fighters and V/STOL-capable jets would be necessary for the navy and air force to offset China’s 7% uptick in military spending, the Taiwan News Agency reported. The Trump administration has vowed “more and better” weapons packages for Taiwan, according to a document obtained by the Washington Free Beacon. Any type of deal between Trump and Taiwanese President Tsai Ing-wen is likely to be announced after Trump hosts Chinese President Xi Jingping at Mar-a-Lago (the ‘Winter White House’) in South Florida. Stealthy V/STOL aircraft are "necessary" to counteract China’s growing military capabilities, the MoD report said, especially “rapid response” threats. 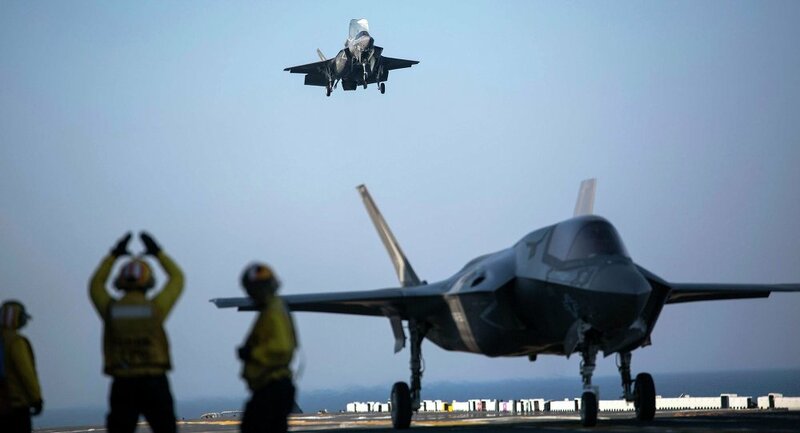 The idea behind adding the new jets, which are likely to be Lockheed’s F-35s seeing as few other V/STOL aircraft exist and Lockheed is actively shopping for new buyers for its pricey jet, is to create a "double-level deterrence" against a potential Chinese invasion. Taiwanese lawmakers were skeptical of the MoD report, claiming that it was heavy on rhetoric and skimpy on details. Tsai added that "double level deterrence" was not sufficiently defined in the report, Taiwanese media reported.